Emma Jane Westby talks about the importance of open source. We saw Emma Jane Westby speak at Git Merge 2016 in New York City earlier this year where she commanded the stage as she spoke about experiencing Git as an adult learner and helping corporate teams’ transition to Git. As a project manager, consultant, and author, she’s been helping teams build software since 1996. Intriguing, vivacious and willing to share, Westby has about a billion things to teach anyone who wants to listen. So, we listened; if you’re a maker and have passion about your life, you should too. When Westby was fresh out of school in the late 1990’s and the Internet was shiny and new, she remembers a pivotal moment that would continue to shape her professional and personal life. “I was doing informational interviews at different companies,” she explains, “And I was at a design agency where I was interviewing with someone, and I looked up on a shelf and saw tons of software boxes in the office I was sitting in,” she continues. That struck a chord with her. “So, I asked the person I was interviewing with: ‘You can get all this software free online. Why are you paying for it?’” His answer: ‘A carpenter pays for their tools and so do I.’” After that, Westby says she decided to get involved in the open source community. Westby has explored so much in fact, that she’s written three books, gives talks and workshops worldwide on open source technology, and has completed an innumerable number of projects. Some of her most notable projects include: running for the Green Party in Canada, working to encourage women in technology through a number of organizations, and coining the “Unicorn Law” which states: If you are a woman in open source, you will eventually give a talk about being a woman in open source. Unicorns are rare and magical. When you see one, you should befriend it and learn all you can from it. Westby is a unicorn who will help get you the information you seek. “A big reason why I’m a part of the open source community is that I just can’t remember stuff on my own,” she explains. “So if I write it down and publish it online 1) I’ll have a better chance of remembering it and 2) there’s always someone who will be able to find it and provide it back to you,” she says. Although she has contributed to The Linux Documentation Project and is active in Drupal, she admits it takes more focus for her to engage in technology. “I want to make the experience of software hurt less for other people,” she professes. “I didn’t come easily to technology. I don’t tinker like other people. And I’m certainly not a hacker,” she continues. “[Technology] takes a lot of energy,” she says. But, making the world a better place is something that does come easily to her. She found her passion and attacks it at all angles. This is something anyone can do. Just find the threads that hold it together…and pull. “What I wanted to to do was to make technology accessible and make the experience that other people have better,” she says. She explains that around 1995, one of the first interesting websites she remembers was as an intern at the Sierra Club of British Columbia. “It was an alternative to ecotourism specifically designed to get people to fall in love with wilderness areas,” she says. “People didn’t have to go to the wilderness to fall in love with it, and for me, as an environmental student, this use of technology made sense.”Sitting in her office, which is filled with sewing machines, garment patterns and a spinning wheel, you can clearly see that she is a maker at heart. It’s important to note that she is drawn to technology because it helps her help people around the world. Want to Learn Something? Teach it. Sharing in the form of teaching comes naturally to Westby. “They say in teaching, the person doing the talking is actually the person doing the learning. If I share what I learn with others, it helps reinforce the information,” she says. “If I want to learn something inside and out I will do a presentation on it; that forces me to take all the information I can find, distill it into one hour, pull out the key points and gather all the things you need to know to get started on a topic.” Westby’s goal is to help learn something new and get started doing it right away. “I particularly like the onboarding ramp,” she says. “I am more interested in people finding things that are exciting to them. Then they come back to me and teach me something that I didn’t know before,” she describes. Again, Westby’s passions always stay within the very human realm of connection. Westby’s first book, Front End Drupal, was simply a way for her to document the things she found important to know but couldn’t remember all the time. 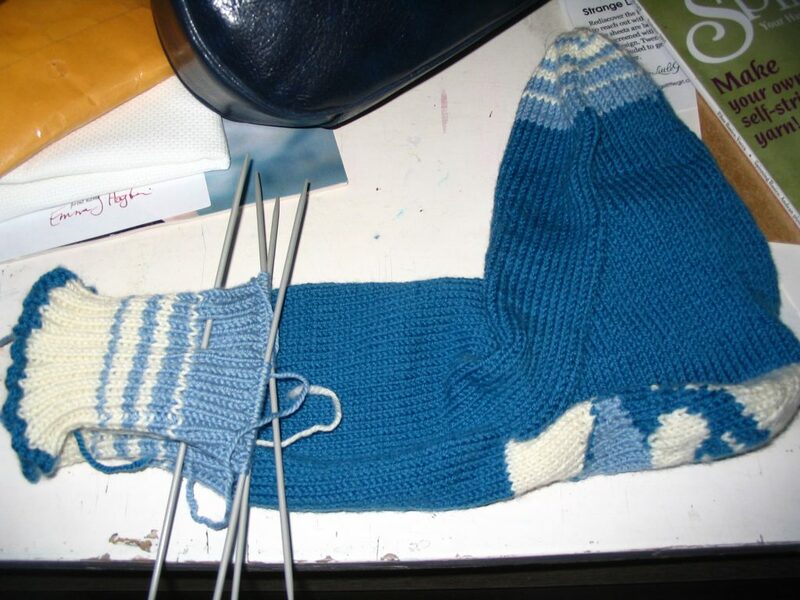 Around this time, she said she chose to knit a friend a pair of Drupal socks as a present. After she documented the process, she gained a certain amount of celebrity. Because who doesn’t want to know how to knit socks with the cute Drupal drop? “My thoughts were along the lines of, “The Drupal mascot is available under a share-alike license, so obviously I have to share my variation of it too,” she explains. So, she simply put it online because once you put something online, it can get shared and someone will have it somewhere. However, she doesn’t necessarily think that most of what she puts online will gain as much notoriety as the sock pattern did. “I just do a lot of things that are interesting to me,” she starts out, “and I’m not really overly concerned about other people needing, wanting or consuming what I’m putting out there. I do it because I love doing it; that’s what keeps it fresh and interesting for me. If I was doing it only for praise, I would have gotten fed up and bored of this a long time ago. It’s output of my own life,” she concludes. Her open source life echoes back to the ethos of an artist and a maker: it’s all about the process, not the product. Your output is a result of your passion for the practice. And, as artists know, if you do it for the reward, you lose all authenticity. Westby is a true creative with an art that crosses disciplines. If you come across an obstacle such as, let’s say, your favorite retailer no longer carries the lotion you need to use for sensitive skin and you can no longer acquire it….do what Emma Jane did: make your own and share it for others to use and alter! Emma uses cheatogrpaphy.com as a repository. Open source is a way of life and doesn't have to always include technology. So, use this, alter and reshare! Author of the best-selling O’Reilly title, Git for Teams, Emma Jane Hogbin Westby has been helping teams build software since 1996. She currently works for UN-OCHA helping humanitarian disaster responders connect and collaborate. Git is a free and open source distributed version control system that is rapidly spreading amongst the software development community. Are you interested in learning more about Git and how to use it more effectively? Tweet @Axosoft and @GitKraken telling us why you use Git or why you want to learn how to use Git, and we’ll choose one person to receive a free copy of Westby’s book Git for Teams. Westby’s book covers creating a workflow strategy with your team; the basic commands you need to implement that strategy; and a “getting started” introduction to using GitHub, Bitbucket, and GitLab. Even if you don’t win the book, you can get a free download of GitKraken—the best cross-platform Git client that can help you be a more productive Git user! Trista is a writer, word lover, talker, strategist and has an octopus tattoo. One dev's suffering is another dev's gain. Including one video that will change your life forever.